Google+ Comments, any replies on Google+ will also appear on your blog. 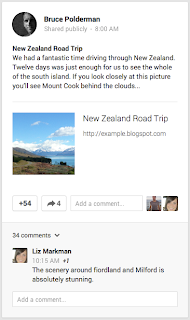 If you've connected a Google+ page or profile to your blog, this new feature will start working the next time you publish a post. If you'd rather not share to Google+, or you'd prefer to be prompted each time, you can adjust your preferences in the Google+ tab of your Blogger Dashboard. Notifying your followers that you've published a new blog post not only gets the conversation going, it encourages them to reshare your content with others. In this way it's critical for growing your blog's audience and engagement. But it takes time. And we want to give you that time back. 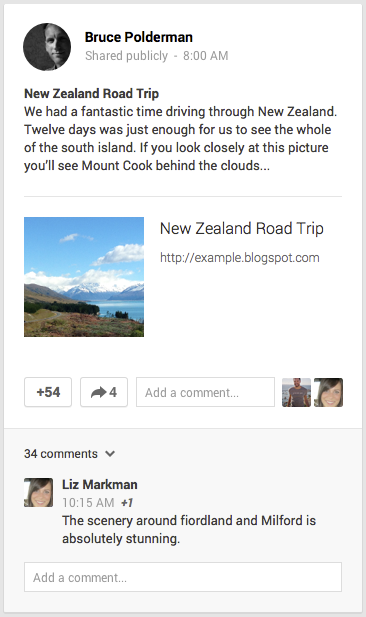 Starting today you can automatically share your blog posts publicly to Google+ — as soon as you publish them, with no additional clicks. 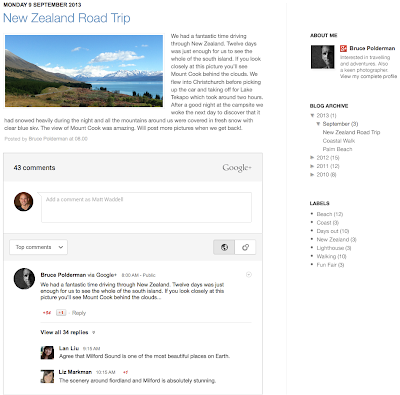 And of course: if you've enabled Google+ Comments, any replies on Google+ will also appear on your blog.